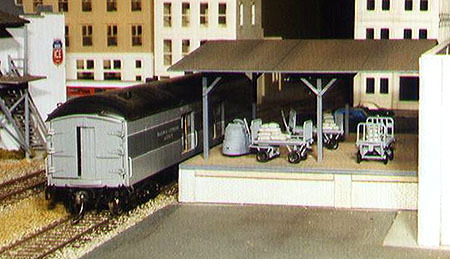 The photos in this section were taken prior to setting the layout's locale in Southern California. They have been updated with the new location names that correspond to the track plan. 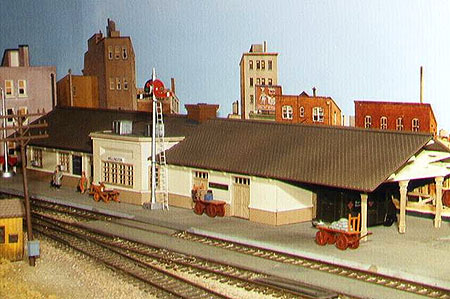 The station at Chapman is a kit-bashed Heljan/Con-Cor NMRA Headquarters Building. 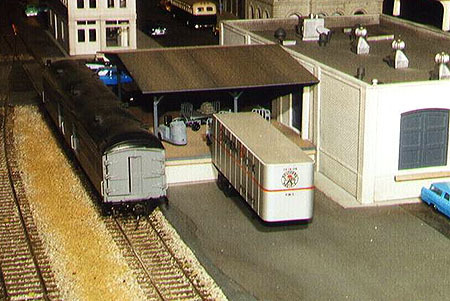 The section with the NMRA logo was removed, additional doors added, the second story above the bay window removed, and the lengthwise roof reversed and shifted creating the extended covered area at the baggage and express end of the station. 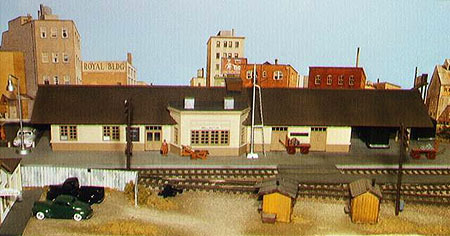 The station is painted in two-tone colors typical of many SP stations. 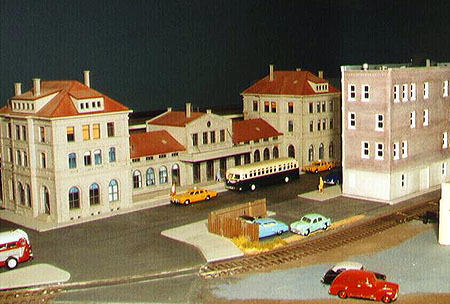 A front view of the Chapman station. The loading dock at the west end of the Chapman station. 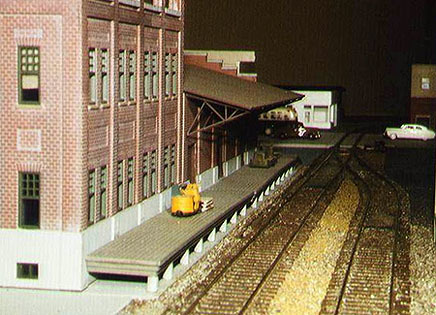 The SP switch engine is sitting on the track used to spot mail and express cars for loading and unloading at Chapman. 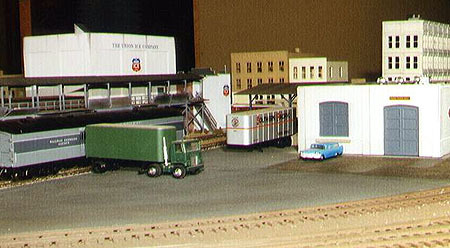 At the east end of the street that runs in front of the Corona station is a combined Railway Express Agency (REA) office and Post Office (PO) rail-truck mail transfer facility. A view of the office (west) end of the REA and PO building. The Union Ice Company and an icing platform are in the background. A view of the front of the REA and PO building showing the REA office. The building was constructed from Design Preservation modular wall sections and measures a scale 82'x44'. A view of the open area at the east end of the REA and PO building. 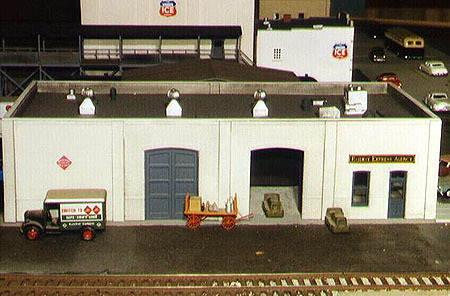 A close-up view of the 44'x33' loading dock used by the Post Office for rail-truck transfer. Note the mail sacks on the carts. 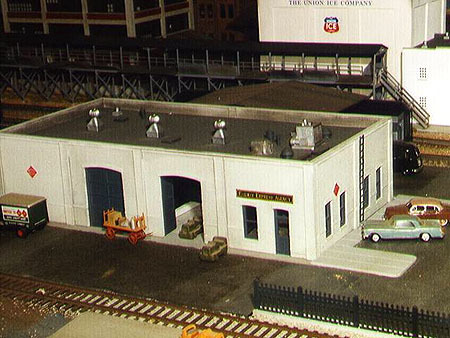 An overhead view of the loading dock used by the Post Office for rail-truck transfer. 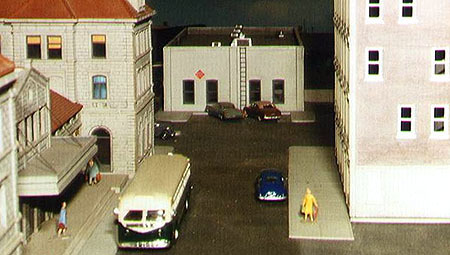 The dock walls are built from Design Preservation modular sections. 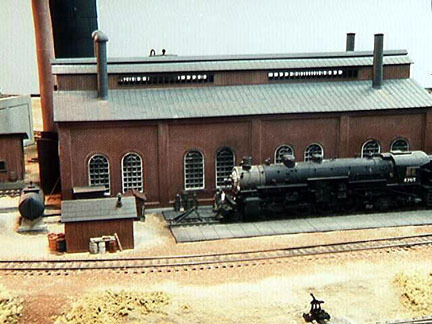 The roof is scratchbuilt. The icing platform is supplied by the Union Ice Company. The Golden State Hardware Distributors warehouse is behind the icing platform at the far left. 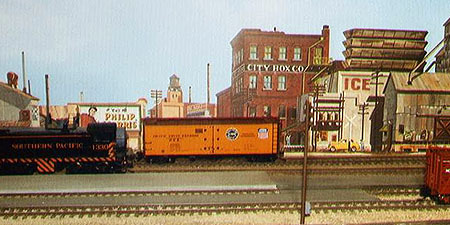 The Golden State Hardware Distributors warehouse is on the right. The Union Ice Company is at the rear where the truck is parked. The Gavilan Citrus Association is on the left. 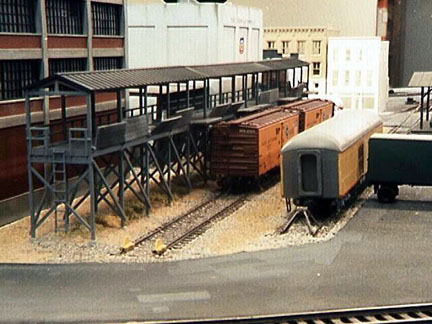 The righthand track serves the loading doors of the Golden State Hardware Distributors. The prototype Gavilan Citrus Association was located on the Santa Fe at Arlington between Corona and Riverside. 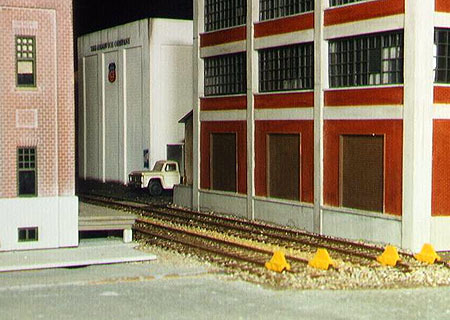 Locomotive servicing facilities for the SP and UP are at the west end of the LA&SD's Corona yard.